Cycle Superhighway 2 has rightly been receiving harsh criticism of late, following inquests in to the death of two cyclists on the route. 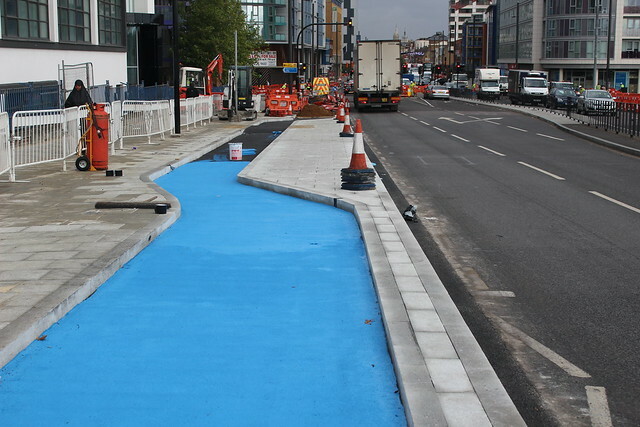 From Aldgate, along Whitechapel Road and across Bow roundabout, CS2 was always the worst of the cycle superhighways, made up mostly of just blue paint on top of existing traffic lanes. But the route will very shortly be significantly extended, from Bow to Stratford, and this new cycle route could not be more different. 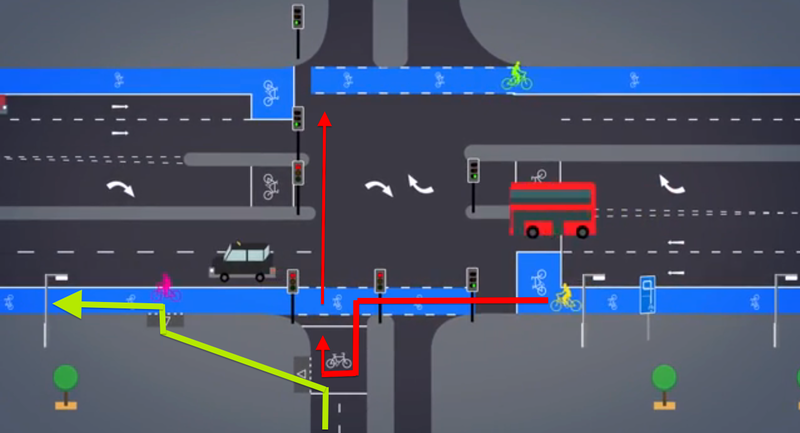 London is about to get its first truly super cycle highway. What's more, a raft of complementary measures will help to grow cycling culture in the area as part of the installation package. Local residents can expect to see some 400 new bike stands being installed along the route, improved signage and feeder bike lanes from adjoining roads, as well as free bicycle training for new or returning riders using CS2. 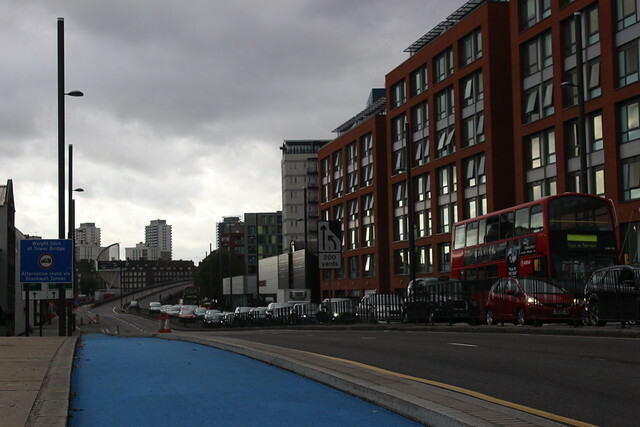 The bike tracks replace a lane of traffic in each direction on what was previously a six lane highway running through the heart of east London. 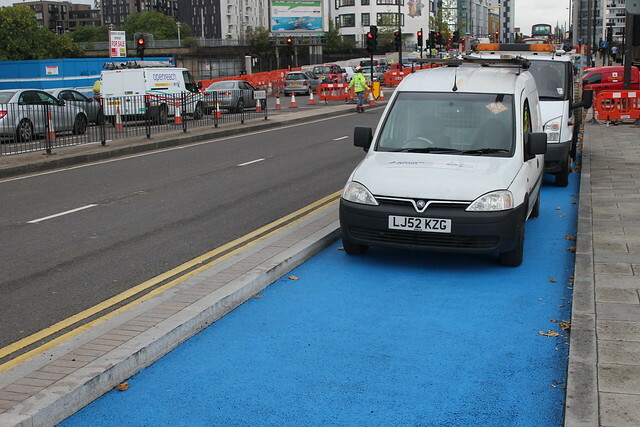 Following the Olympics - when the new bike lanes were used as "Olympic family lanes" - TfL realised the space could be reallocated to other users whilst only delaying existing motorised traffic on the route during the AM peak by 90 seconds. For those who have been battling against TfL's "smoothing the traffic flow" network assurance concerns for many years, this is a very significant breakthrough. In a first of its kind for London, innovative bus stop bypasses will take the cycle track behind "floating" bus stops where passengers will wait to board. When buses stop to pick up passengers it will be the motorised traffic - and not more vulnerable cyclists - who have to move out in to the fast lane to overtake. 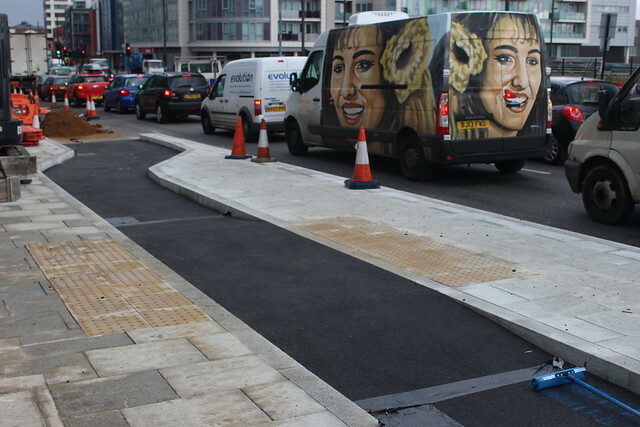 To protect pedestrians, the cycle track narrows as it enters the bus stop bypass to encourage riders to slow down, and tactile pathing will help pedestrians with limited vision identify the safe crossing point. A "speed table" where the bike track raises to meet the level of the pavement has been installed to give a flat crossing surface to the bus stop island; great for raising awareness to cyclists that they are about to interact with pedestrians, and vital for those using the bus who may have limited ability or buggies and wheelchairs. I do have some concerns about elements of the design I saw being constructed over the weekend, though I will reserve full judgement until the extension is completed and officially open. Some easy fixes would be to increase the length of the pedestrian "speed tables" for people joining the floating bus stops, or to install one at either end to discourage pedestrians from stepping in to the rest of the bike track. I'm also worried about the height of the curbs, which are flat-faced and do not allow for much wiggle room if you strike them. As pointed out to TfL during the consultation stage, slope-faced kerbs - though much more expensive - would allow cyclists to utilise the full width of the 2-metre lanes; useful when large groups are riding together or when faster riders wish to overtake slower cyclists with a bit of extra room for comfort. These should most certainly be installed on the bus stop bypasses, where the bike tracks are narrower, as a minimum. The opposing sides of the cycle track do not have equal geometry on the entry and exit "curves" of the bus stop bypasses, which could cause incidents when the tracks are very busy - I suspect this is down to a rushed installation based on unclear drawings, and is something that future schemes should seek to improve on. For me, what is most exciting about these cycle tracks is that they will help to animate Stratford High Street with actual people. Historically, this has always been a severely car-choked highway with a serious air quality problem, designed primarily to speed along traffic that originates from outside the area. And yet, when you spend time on the road, you begin to see that there is life here. In addition to rows of terraced housing just off the main road, there is a church, a nightclub, some great restaurants and cafes, a University campus and student accommodation, a number of hotels, a supermarket, a primary school, and a bingo hall along the route. Soon, a resident living on the route will be able to safely cycle to the town centre, or even Westfield, using the CS2 extension. And connecting with the route are the Bow roundabout floating underpass and canal-side traffic-free routes along the River Lea and Bow Back Rivers, as well as the 7km Greenway walking and cycling path from Beckton to Victoria Park, as well as the Queen Elizabeth Olympic Park itself. Once the QEOP is fully open and the Greenway re-connected after Crossrail stops digging up most of Pudding Mill Lane late next year the Cycle Superhighway 2 extension will connect with miles of traffic-free cycle routes, creating the beginning of a safe and comfortable cycle network in the area. And just as Stratford High Street is changing, so too will the profile of cyclists here. These facilities will allow older riders, children, more women and even less abled cyclists the opportunity to ride here - something you would not have seen when this was a six lane wide road. In turn, those riders will have to learn to take extra care on the bus stop bypasses of pedestrians - particularly those who are less mobile - something that will be encouraged by the speed tables and additional signage. There will be some in cycle campaigning circles who will hate these cycle tracks because of long-held feelings that separating cyclists is not the right way to go, that it is some kind of surrender. At the other end of the spectrum, hardened advocates will argue that these designs are 'not Dutch enough'. To both I say this; TfL have had to install separated cycling infrastructure under the duress of a UK legal and road rules system that simply doesn't yet know how to accommodate such plans. As such, their hands are tied with how far they can push the envelope. For most of the route, the cycle tracks are so wide that you could drive a car down them. Indeed, a lane for motorised traffic has been lost here in both directions. It's not very often we get to congratulate TfL on a job well done, and to those quick to criticise I would say this; reserve your judgement before you've actually come here to Stratford and ridden the tracks yourself, and seen them in situ. They're not perfect, and there are lessons for TfL to learn, but they're a damn site better than anything built on a major London road before. 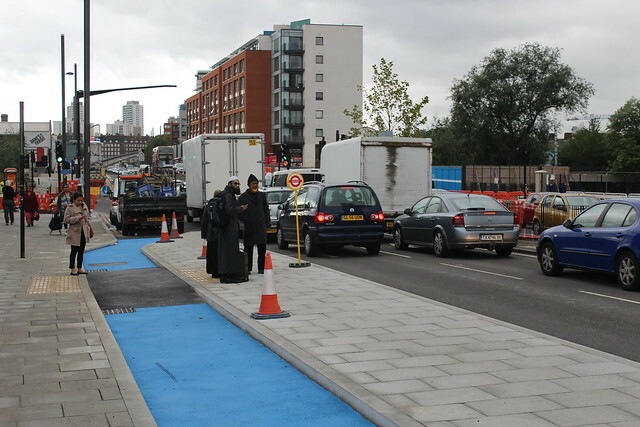 I for one can't wait for more of London to start looking like this; let's start with the shocking state of the rest of CS2 down Whitechapel Road shall we? 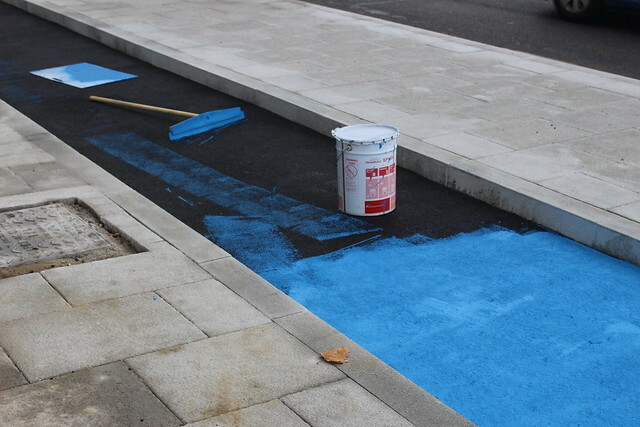 While I applaud TfL's efforts in this matter, do they really paint the roadway with bloody rollers? As always I kindly refer you to the Netherlands to see how you apply colouring in a way that doesn't wash out in a matter of months. Also while I'm having a rant, what's with those ridiculous kerbstones? Forgiving kerbs have been around for decades, and they're especially useful on such a narrow path with a sudden 45° turn in it. When approaching this bus stop you're going to have to make sure you're in the middle of the path, make two turns in quick succession and simultaneously watch out for bus passengers. This is the kind of thing that makes non-stressful off-road cycling back into a stressful experience. I quite agree about the forgiving kerbs - these were recommended to TfL at consultation stage and as I mention in the post I hope that when the niggles with the new design are fixed these will be installed on the floating bus stops as a minimum. 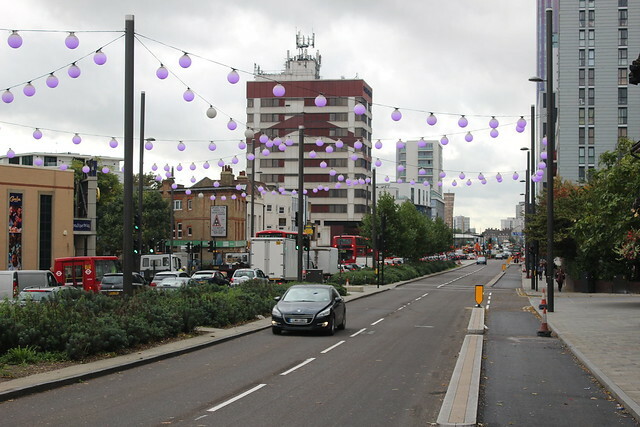 1. isn't this Newham Council's road? Shouldn't they get some credit? 2. decent work on the straights, they do look adequate, but that's the easy bit. 3. the kinks at the entry & exits to the bus bypasses look like an accident waiting to happen, especially (as you mention) with the vertical kerbstones, and the narrowing seems unnecessary. One question - what was the motor traffic like while this was being installed? Presumably there was some disruption to the traffic flow, TfLs bete noire. But maybe Newham Council take a less rigid approach to such issues than TfL generally do. Anyway, interesting stuff, & I look forward to a report on the more difficult bits. When will it be open? Is there a launch? Having been on a lot of protest rides, it would be nice to go on a ride that celebrates something. @Jane It is due to open October 31st, I don't know if there is an official launch, though I can't see the Mayor not wanting to come and cut a ribbon? As to a celebration ride, that would be awesome! Thank you for bringing us up-to-date with things on the ground. It must be said that certain parts look to be of an exceptional standard. I very much hope that the scheme proves to be a great success. Mark, you write: "In a victory for campaigners who have been pushing for separated safe space for cycling since the last Mayoral election, the 3 kilometres of new cycle route are made up of largely segregated cycle tracks running either side of busy Stratford High Street." Could I please ask you to confirm that the new cycle route is in fact three kilometres in length? 5 million not to sort out Bow junction! I have just realised that the 3km-long cycle route must actually be made up of a one-and-a-half kilometre section on one side of the road, and another one-and-a-half kilometre section on the other side of the road. Whilst it is of course absolutely true that one-and-a-half plus one-and-a-half equals three, the newly-installed cycle route is in fact just about a mile long. Do you think this sounds about right? @Anonymous Works to resolve the cycling conflicts at Bow junction are ongoing. To resolve it completely - ie radically change the structure of the Bow ROB - will cost considerably more than £5M. @Jitensha Oni I've not seen those A4 cycle tracks before, what are they like at junctions on that hideous road? You're right this is a Newham Rd, with TfL leading the design process. Indeed, the only reason this is an extension is because Newham would not allow TfL to proceed with all of the CS2 route before the Olympics. They've certainly done very well out of that decision and deserve credit for their forsite. As to the traffic, it was pretty bad at the weekend, but then the Central Line was closed, the Bow flyover was closed and the traffic lights were being re-surfaced all at the same time. 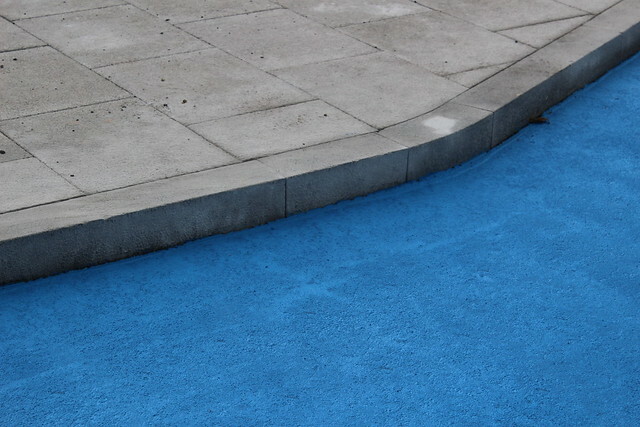 We will have to see what it is like when it is finished, but TfL's models say it will be fine. I share you hope that this will turn out to be a big success. I assume this doesn't change any part of Bow roundabout? Any ideas how much this 1.5km in both directions has cost? It will help us get some perspective on funding for decent infrastructure on a bigger scale? Here's hoping that once London's cyclists taste the goods, they will demand even more! I believe the route was put in back in the 1930s. When I used to ride out that way in my yoof, it was always a relief to get off the main road. Sadly in many places it was used as off road parking. I am prepared to be corrected as I haven't been that way since 1990! 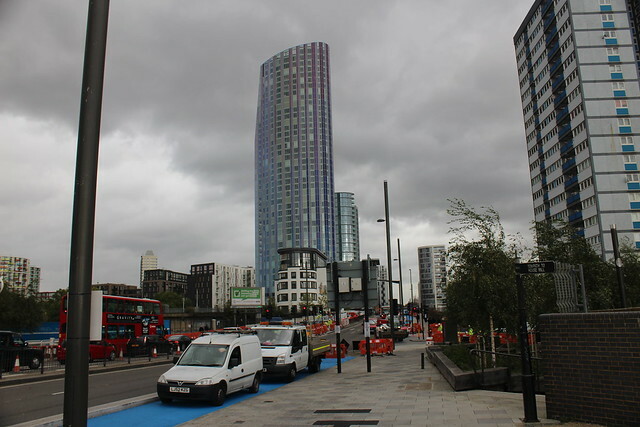 Having just been for a walk along Stratford High Street, there's still a phenomenal amount of work to do if CS2x really is to open, in both directions, on October 31st. Eastbound in particular looks wholly unconvincing as yet. I also spotted Andrew Gilligan riding through, westbound, and stopping to chat to people at an unfinished bus stop. Right so TFL were told early on in the consultation stage about the problems with the straight kerbs and they ignored it. It seems that TFL treat consultations as a box ticking exercise which can be completely ignored. Their supercilious arrogant attitude is endemic, which is how they can simply ignore the safety and convenience of anyone not in a motor vehicle. Not sure how this will ever change. Maybe what's needed is for the next mayor to simply sack the lot of them and employ Dutch people to do the job properly. A phenomenal amount of work has been done since yesterday, especially in slapping down the blue paint. If they can do a similar amount of work with signage overnight, then CS2x should open tomorrow. There appear to be a few duff bits (for example, the entrance to the Bow Flyover bus stop bypass can be completely blocked by queueing traffic). Overall, however, the entire length of Stratford High Street now has segregated (but frequently-interrupted) cycle lanes. It's a substantial-looking upgrade, and I'm sure will be widely welcomed. Thanks for the update @Diamond Geezer, it looks like things are - somewhat astonishingly - "all systems go" for a media launch of the CS2x today. You're correct that it is a substantial upgrade, and the news that the rest of CS2 is to be upgraded to a similar level of quality is welcome good news. Good article. I agree that, whilst still somewhat flawed for the reasons given, this is a massive improvement on the rest of CS2 which I have always regarded as a potential death trap (sadly, all too correctly). The new part is definitely open today as my wife and I cycled south-west towards the Three Mills river. We didn't see another cyclist and no signs announcing it is open either - it was just open. I trust that the niggles which remain will be sorted out eventually. I look forward to Tfl doing similar things elsewhere -preferably starting with the rest of CS2? These highways are constructed after the detailed research as it could be a medium for the transport of costly products. The article states that forgiving kerbs are "much more expensive" than standard ones, but according to "The Ranty Highwayman" they're not. Certainly, if the existing edge-of-road kerbs were to be replaced, that would add to the total cost, as the existing kerbs are usually retained. But when installing new kerbs there's no significant cost difference. Hmm. I'm not sure where Gilligan got that from then! I'll ask around some more. They're all just moulded blocks. Looking at your suggested Copenhagen-style right turn, having been down there it seems it can't work like that. TfL's video omits the pedestrian crossing in front of the ASZ which will be at green at the time the manoeuvre is made, preventing legal access to the ASZ. There's a small space between the crossing and the carriageway which could be used but that won't hold more than a couple of bikes.